Keep your cool this summer along with your greenhouse and protect your plants from the scorching weather. Read on for things to do in the greenhouse in August and tips on purchasing a greenhouse. I've also included an interesting article on "Back to the Land" philosophy. In next month's issue you'll learn how to make money using your greenhouse year-round! This summer has been a scorcher for many of us and August can be a critical month for your greenhouse because of the intense heat. Too much heat can scorch your plants causing them trauma. Be sure to ventilate your greenhouse by opening all doors and vents. If it remains too warm inside the greenhouse and you notice your plants wilting, you will need to be more aggressive with your cooling methods. 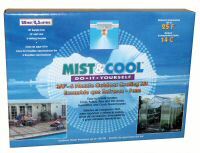 Cooling by mist is a quick way to cool your greenhouse down by about 20 degrees F. This misting kit is compatible with all greenhouses and your plants will love it too! Especially those of you growing orchids. It includes 22' of misting line, plus 18' of lead line, garden hose adaptor, 12 misting nozzles and mounting clamps. Each nozzle emits tiny mist droplets that cool the surrounding air. It can be used with a timer as well. Cooling Tip: To cool down your greenhouse, try "damping down". Take your hose and spray both the exterior and interior of the greenhouse. This offers immediate relief. August can sometimes bring harmful insects that will thrive if you let them. Watch for spider mites, thrips and white flies and eliminate them immediately. Make certain that you keep the greenhouse clean. August can be a risky month for mold and mildew. August is also a great time to scrape off old, dry soil from the top of your plants and fertilize them generously to allow them to continue to thrive for the remainder of the season. Check out your garden shops for greenhouse and gardening tools and equipment. Everything goes on sale at the end of the season and you will likely save money. Consider stocking up on plant food, soil, bulbs, fertilizer and containers that you can use in the future. For the avid gardener, owning your own greenhouse is a dream come true! The idea of being surrounded by beautiful plants and flowers year round is exciting, however, you must consider and plan wisely to be sure you are selecting a greenhouse that will meet your needs. Budget -- We offer over 8,000 styles of models and sizes of greenhouse. In addition, we can make a custom greenhouse to suit any space, making the sky the limit. The most important factor to consider is your budget. What can you actually afford? Remember that you will need extra cash for heating and cooling once the greenhouse is built. You should also alot for benches, shelving, equipment and materials needed for start up. If you are choosing to have the greenhouse placed on a raised foundation wall, that must be accounted for as well as the foundation and flooring. About 95% of our customers build their greenhouses themselves, but if you want to hire someone, you'll need extra cash for that as well. Size -- It is wise to take in the entire garden area as a whole. Try to imagine the greenhouse in different spots within your garden. If you are having difficulty visualizing this, use a rope or garden hose to "map" out the greenhouse in your yard. Choose a style and size that will add to the esthetics of your garden. Always buy the largest size that you can afford. As gardeners know, once you get bit by the gardening bug, it is difficult to stop bringing plants home! 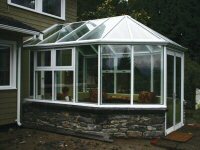 Remember to consider if a lean-to home attached greenhouse would be better suited to your needs. Heating -- If you live in a colder climate, heating your greenhouse during the winter is necessary. Strategically placing your greenhouse in a location that has southern exposure to the sun is best and we recommend the top ridge of the greenhouse turn east to west to maximize that exposure. Building an organic heat sink in the greenhouse can supplement the temperature. Insulate the greenhouse using styrofoam and wrapping plastic around the inside. This creates an extra layer and helps to keep the greenhouse warmer. Think of it as a winter coat for your greenhouse! With the slowness of trade and industry, and tough economic times that exist today, people are gravitating toward the natural, and the most obvious place to start is in the garden. Schools are also teaching students to use their green thumbs through a number of gardening and greenhouse programs. If people don't own their own land, they are setting up or using community gardens to grow their own food. As our population ages, a self-sufficient and simple lifestyle is more popular than ever before. Getting back to the basics is becoming a way of life. People, both young and old, naturally gravitate to nature. In the documentary film Ecological Design: Inventing the Future, Phil Cousineau explains, "The world was forced to confront the dark shadow of science and industry...There was a clarion call for a return to a life of human scale". After a natural disaster or a global tragedy or war, Cousineau's observations are discussed and analyzed over and over. Today, the popularity of "homesteading" (another term used to describe "back to the land" philosophy, is prominent as a lifestyle along with the Green Movement. Search the internet and you'll find hundreds of websites devoted to a simplistic lifestyle.